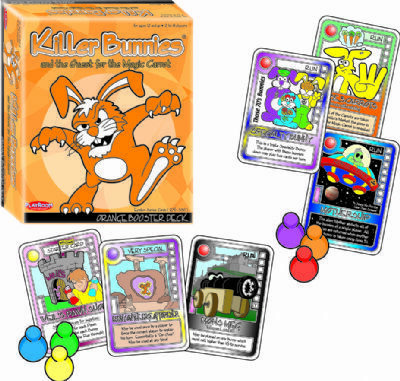 The KB Quest Orange Booster Deck features even zanier Specialty bunnies and introduces the Pawns (which will reveal the secrets of the P-Cards)! Along with that is Weil*s Pawn Shop, naturally, where players may buy back discarded bunnies, in addition to the pawns, themselves. Also included are Double Free Agents (to make Bunny Triplets even easier), ive Disclosure (to reveal your opponents* cards before they*re played), Bunny On The Edge Of Forever (to force opponents to have a *do-over*) and more. All of this helps the Quest Orange Booster deliver increasing scopes of strategy and even more twisted ways to win!